XET refers to a token that can be exchanged with Eternal Coin (XEC) at 1:10 ratio. 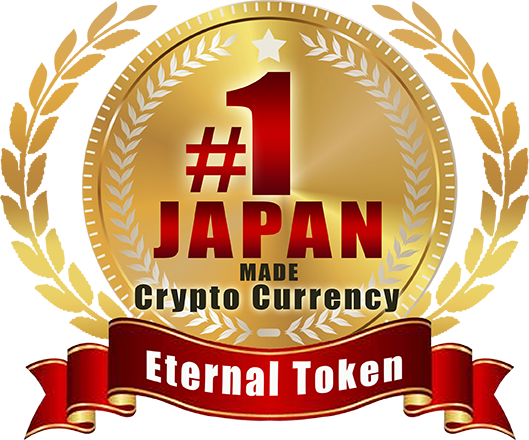 Eternal Coin (XEC) can be traded and acquired via authorized exchanges ONLY which leads to the disadvantage that XEC can’t be acquired via ANY unauthorized exchanges throughout the world. Therefore, Eternal Token (XET) is developed to be listed and tradable with various currencies on global exchanges. The issuance between two compatible virtual currencies is a new form of virtual currency to solve the disadvantage of XEC and other currencies with similar situation. Advantages ・Fiat Currency Exchange・Transfer via Phone Number・Value Division System・Weekly Dividends Distribution. ・Guaranteed from Cyber Hacking and Unauthorized Wallet Access. ・Tradable with Various Currencies on Global Exchanges. Disadvantages ・Tradable with Eternal Coin ONLY. ・Eternal Wallet functions cannot be used. ・No guarantee from cyber security like hacking or stolen password. ・Guaranteed from Cyber Hacking and Unauthorized Wallet Access. Disadvantages ・Tradable with Eternal Coin ONLY. Advantages ・Tradable with Various Currencies on Global Exchanges. Disadvantages ・Eternal Wallet functions cannot be used. XET is tradable via the exchanges below. For conversion between Eternal Coin (XEC) and Eternal Token (XET), please visit to the URL below. ※In addition, for Japan users, trading or transacting XEC/JPY is not yet available until further notice. Fujino Hiroyuki has over 10 years experiences of leading industry expertise in founding and co-founding numerous companies in domestic and international marketplaces. An experienced director of overseas business development with demonstrated history of working in blockchain and cryptocurrency industry. An organized and creative professional with proven marketing skills and over years experiences in brand design coordinator for a diverse variety of organization and clients. Experienced in overall corporate governance and strategy, business development of international markets, and overseeing global investment and incubation programs. Accomplished creative professional with a proven track record in all aspects of the end-to-end creative process ranging from conceptualizing to execution. Dynamic leader with extensive experience in R&D, Product Development, Engineering and proven track record in jump-starting product development. Experienced BD Associate who is strong at utilizing current trends to develop sales projections. Adept at developing effective spreadsheets creating engaging presentations. Versatile, hands-on technical leader who enhances global market presence for leading software corporations, with extensive expertise in scalable, single-solution development for diverse customer needs. A former International Market Managing Director of Eternal Link Japan, now the President and Chief Executive Officer of Eternal Wallet PH Holdings Inc. He graduated from Notre Dame University of Cotabato City with a degree of Computer Engineering. He started working in the BPO industry in 2007. After 5 years, he started working online at home as an educator and an adviser. She oversees a company’s business operations and reports to the CEO. Ensures the company has effective operational and financial procedures in place. Arven Jay Abelo is responsible for maintaining and improving the performance of the existing software to ensure its functionality, optimization and recommend improvements to existing software programs. In charge of developing computer applications that allow users to perform specific tasks on computers or other devices. He also develops or customizes existing systems that run devices or control networks. He has qualifications in project management, sales, and customer relations with excellent communication and administrative skills to effectively work both invidually and part of a team. John Emerson Buenviaje has 5 years experience in web & graphic designing. Graduated BSIT (Bachelor of Science in Information & Technology) major in Multimedia. He monitors expenditures, revenue, and use of company resources to ensure businesses operate within the budget and responsible for internal auditing, analyzing and submitting accounting reports. She manages the financial resources of the company to ensure the efficient and effective functioning of its operation. She creates financial and regulatory reports to the management and other stakeholders. She is responsible for ensuring the established standard of quality including reliability and usability of specific IT project. She holds a degree of Bachelor of science in information technology from University of Mindanao. Attorney of Takechi & Partners, Member of the Tokyo Bar Association. Head of Human Resource Practitioner and Mindanao Trustee of People Management Association of the Philippines.